This is going to be a difficult summer for many teams thanks to a salary cap which has risen by less than expected early in the year. For a team like the Edmonton Oilers, there’s a chance to land talent from a team in cap trouble. Taking Advantage of Cap Hell is dedicated to looking at clubs reportedly in cap trouble and figuring out who might shake loose. However, I’ve had some requests for a more precise look at the Oilers’ own situation, so rather than look at a vulnerable opponent our attention today turns to the home front. For the sake of simplicity I have made a few assumptions. Connor McDavid is penciled on to the roster, and paid the rookie maximum. Darnell Nurse and Leon Draisaitl both make the team. Three restricted free agents (Justin Schultz, Martin Marincin and Tyler Pitlick) are given one-year qualifying offers and all accept. Here’s what the team looks like with those assumptions. Superficially, that’s not a lot of cap space, though it’s all luxury space in the sense that this roster is entirely staffed. The problem though is that if Edmonton does something like, say, spend $5.0 million per season on Antti Niemi (sending Laurent Brossoit down to Bakersfield in the process) that pretty much fills it up. As it stands, this roster has room for one pricey addition. But appearances can be a little bit deceiving, because the truth is that Edmonton has all kinds of options here to open up cap space. Buyouts. We’ve talked about these before. For my money, Andrew Ference isn’t really a great option because Edmonton would be turning a two-year contract into a four-year deal and he’s not really bad enough to justify it, so let’s just take him off the table for now. Buying out Nikita Nikitin, bumping up Nurse and Marincin and adding Brandon Davidson ($704,000 qualifying offer) to the roster opens up an additional $2.30 million to add help. Buying out Teddy Purcell, bumping up Nail Yakupov and adding Iiro Pakarinen ($925,000 cap hit) to the roster would clear an additional $2.08 million in space. Potential impact: $4.38 million cleared. Walking away/club-elected arbitration. Most of Edmonton’s restricted free agents are cheap, and not issuing a qualifying offer would not result in any significant cost savings. The exception is Schultz. who has that hefty $3.675 million qualifying offer. Edmonton could just walk away, bump Nikitin over to the right side and insert Davidson at a cap savings of just over $2.97 million. Alternatively, the team could take Schultz to club-elected arbitration in lieu of a qualifying offer, which could see an arbitrator knock his contract down by up to 15 percent, with Schultz then coming in at a figure potentially as low as $3.124 million (a savings of $551,000). The trouble with club-elected arbitration is the Oilers would be bound by whatever contract the arbitrator decided on. Potential impact: $2.97 million cleared. Entry-level bonuses. McDavid, Nurse and Draisaitl all have entry-level deals with modest base salaries and signing bonuses and significant performance bonuses. Edmonton has the ability to exceed the cap by the amount of bonus room on each player’s deal, and if those players don’t hit their bonuses there isn’t any negative impact (if they do, the money gets tacked on to next year’s cap). Without knowing the exact structure of the players’ contracts it’s hard to say exactly how dangerous this is and how many bonuses the Oilers could legitimately regard as unattainable. I’d be uncomfortable taking this risk with McDavid, and Nurse’s bonuses are relatively modest, so the big candidate for savings here is Draisaitl. (An alternative approach would simply be to hobble Draisaitl’s bonus chances in the name of development by assigning him to Bakersfield for 20-odd games to start the year). Potential impact: Unknown; my guess would be something in the range of $2.3 million cleared for Draisaitl. Run a 22-man roster. I think we’ll see this sort of thing more and more as teams battle with the salary cap. The 23-man roster protects a fringe player from waivers, but arguably a team doesn’t always need more than one spare up front and another on the back end. Edmonton could go with 13 forwards and seven defencemen, burying a player like Gazdic, Klinkhammer or Pitlick out of the gate. Potential impact: Up to $800,000 cleared in the event Gazdic is the odd man out. Naturally, Edmonton could also attempt to trade money away, too. If I were the Oilers’ G.M., here’s how I would look at the situation. On the buyout front, I’d be reluctant to buyout more than one player; we don’t know what the cap will look like next year and there’s a real risk in deferring to much money to the future. Nikitin would be my choice, clearing $2.3 million (though I’d first look around to see if a retained salary deal involving either Nikitin or Purcell was of any interest to my fellow managers). I would attempt to negotiate a lower contract with Schultz, and if that failed I’d take him to arbitration, fully expecting to see his contract knocked down by $500,000 or so on a one-year deal. I’d also be comfortable going into Draisaitl’s bonus cushion, and wouldn’t hesitate to start him in the AHL if his training camp is anything short of stellar. The 22-man roster is an option but not an ideal one; there’s value in having a useful ‘tweener protected from waivers. The sum total of those decisions would allow the Oilers to spend up to $5.1 million more than initially laid out, giving the team $9.7 million in total cap space to pursue upgrades (plus, of course, whichever players are subtracted from the roster to make space for newcomers). If it’s done right, that’s probably enough space to add two defencemen and a goalie, though it’ll take some footwork on the part of Edmonton to make those pieces fit. What are the Oilers going to do with Martin Marincin? What’s the best way to change the makeup of the Oilers’ top-six? Should the Oilers be interested in Jared Spurgeon? About time the Oilers payroll was discussed. This is the reason why Petry was let go, and why Mact had no problem trading Perron. A Petry contract means the Oilers are capped out. The Oilers have been dealing with CAP HELL all season. Sort of ironic that most of the stories have been about preying on other teams Cap problems (Stanley Cap winning teams) while all season long other teams have been preying on the Oilers. 1. Put Draisatl and Nurse in the AHL. Leave them there all season. That’s $5.1 million. If they are really focusing on player development, then putting Draisatl as the #1C (playing PP, PK) and Nurse #1D (PP & PK), they develop their players and keep space on the cap. 2. Hall, RNH, Eberle are $18 m. If you trade Eberle for top-2 d-man, should be close to a wash, but the new d-man bumps down Schultz or Klefbom to a place where they have a better likelihood of success. And btw, how is it we see a lot of articles how Jultz is a 5/6 d-man and a PP specialist, but is still a top-2 d-man in this scenario? 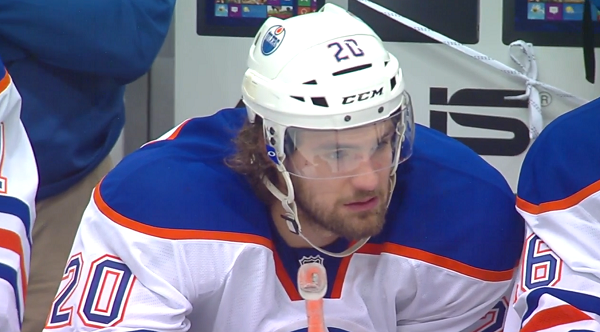 If he blossomed under McLellan, then he moves up the old-fashioned way, through quality of play. Or they could do nothing at all, and hope McLellan can coach them up and wait until all of the bad contracts expire. That’s a solution too, though not a popular one among fans ready to see the playoffs now. If you get rid of a major piece such as Eberle to fill another glaring hole , you are stuck with another hole to fill properly for Eberle . You cannot continue to do that vicious cycle as you as you end up with another major hole to fill . Your getting no where that way , just moving the hole(s) around . If Nurse, Draisaitl and McDavid are NHL ready then start them on main club , as they alleviate some of the cap space required to acquire others this upcoming season . By your method you appear to want us to add fillins (probably not future players ) at quite an expense to keep them on the farm . I have not given up on Schultz , as he is maybe the only one still providing much offense from the defence . Not like we are blessed with many ,or any , beyond him right now . Put Nurse in the AHL unless there is a quality veteran for him to play with (which they currently don’t have). Put Draisatl in the AHL, or if they trade Eberle, you can slot in Draisatl on the wing for McDavid or Nuge. Lots of good teams will put centres on the wing, so that they are able to move lines as needed. Re: Jultz, the old pecking order is gone. They have a new POHO, GM & coach. Jultz has to earn the spot, so we can’t just pencil him into a top-2 role. 70.3M = right below the cap considering its 71M. Going to SJ is Yak, Marincin, + picks? Also out of the lineup are Ference, Nikitin, Scrivens, and Purcell. Purcell is a tradeable asset even if hes just traded for a prospect or a pick, could even be added to the Burns trade. Ference and Scrivens could each fetch a 5-7th RND pick. Nikitin could be bought out. LHD looks a bit young but idk, just my take on how the Oilers should look next season. Trade Purcell to a cap floor team that nets you out at $8.0M of cap space. $3.5M on a keeper and $4.0 on a good dman. Work on the rest next year ….. There are some good points here but I sub in Yak, Marincin and picks for Burns. I would love to keep Eberle but there’s no way we will be able to land that big defenseman this team desperately needs. Not trading Hall or Nuge. Going to have to sacrifice some fire power up front to bring in the #1 def. Unless of course you want to take the route Mact was preaching and wait another 4 yrs….ugggh! I can help you with that…. Eberle is winning the scoring race on a terrible non play-off team. IMO you have take from a strong spot 5 first overall (counting Slepshev) and improve our weakest spot … Our defense. Only way to get a top pair dman to play next year is to trade for him. It’s pointless to try and explain to a lot of these people the difference between a top 2 dman, and a single forward on a team. I have gone Ad Nauseam about how much more affect a dman that can play near 30 minutes per game, can have on a team than a single forward. It has been proven over and over that the oilers can’t win without proper defense and goal tending. If anyone thinks using an eberle in a trade to aquire a seabrook is plugging one hole, and creating another, then you have zero common sense. You are creating a hole, to plug a giant ship sinking gash. It was a random example created just for point, not a specific trade proposal. Seabrook will be super tough to get. don’t get your pants in bunch. patience is a Virtue. let’s see what a Real coach can do with Yak and the D. Trade Leon. I hope they make a deal with Nashville for Seth Jones. 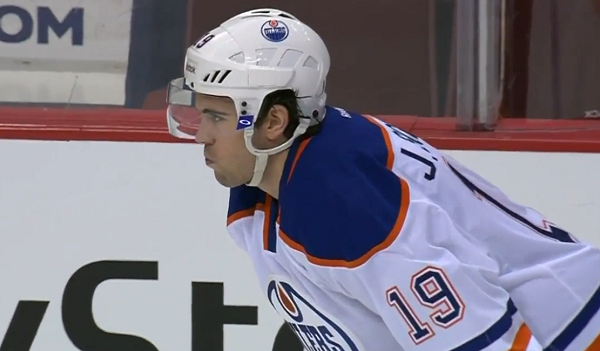 Eberle or Dr Dre. Over pay a bit if you have to. This guy is going to be a stud for a long time. Imagine Jones And Nurse together. Gives me shivers. Is it ok to dream again? After watching McDavid in that video,I can’t help but think of all the attention his speed and skill command during a play or on a rush,and what keeps coming to mind is,these little passes to Yakupov. Who while everyone is watching Connor,finds a nice spot to take the craziest passes,and put them in the back of the net. I think these two could be similar to the Oates and Hull days,and that sounds pretty scary,considering you could leave the Nuge line together,and add Pouliot to McDavid and Yak,for some net presence and two way ability. Then again,Hall and McDavid would be insane. They would be the leagues fastest one two punch by far,and there isn’t a pairing in the league,that wouldn’t back off,when they were on the ice. They should be able to trade Jultz, but only if they retain some salary. From watching Jultzy over the past few years I doubt he can suddenly change his game. More Nurse less Jultz please. @Willis Wow, pretty impressive knowledge of the cap, kudos. 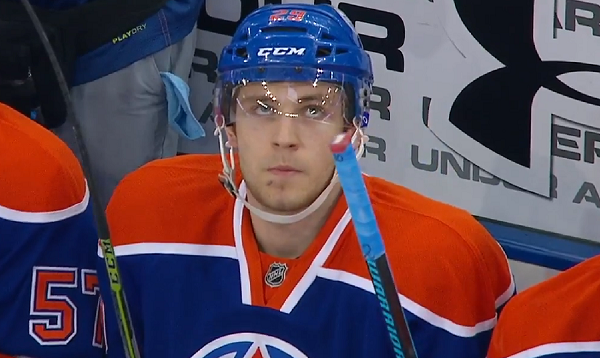 Start Nurse in the AHL but Draisaitl makes the team because MacT already burned his first year unnecessarily. We can avoid that with Nurse, and still give him great experience in the AHL for 1 season. That’s what I hope happens in the off season. All free agent contracts need to be max 3 years because of McDavid, hopefully Chiarelli realizes that. We have a better chance of getting Crawford than getting Seabrook. I’d trade Scrivens and a 3rd for Crawford whereby Chicago retains 1 million but push for 1.5. Sweeten with Montreas 2nd rounder. At the end of the day, Chicago is going to have to do something so it could be done even without a pick in return the closer to the start of the season. That frees up 2.5 million in cap, to sign a 1.5 mill back up named Richard Bachman. Crawford as the starter at 4.5-5 million is ok in my books but not at 6. Chicago clears 2.5 mil in cap space and gets out from a very long contract. To Oilers – R.Murray , J.Boll and D.Heatherington for Yakupov and Klinkhammer . I suspect given the lack of term on Nikitin, Purcell, and Scrivens that including an asset (say a 3rd round pick) in a larger deal the Oilers could rid themselves of these players. I also think Ference, like Staios before him, probably would generate more interest than one would think and could perhaps be movable. Those would be my big targets for trade, i’d also consider dealing Gordon if the Oilers could pick up a guy like Maholtra for much cheaper and play the 4th line less but still in dzone situations. I think the Oilers would be wise to give Schultz another year, he knows quite clearly now that he’s got some work to do and he’s going to get a coach that’s done well with offensive dmen. Please understand that I am a fan of Jordan Eberle and I like how he plays the game. Having said this however, I agree totally that trading Eberle for a solid 1st pairing D man would be a very solid move. As has been stated here many times, it is much more difficult to obtain a top pairing D man than it is to obtain a winger who scores a bit. If you further compare the amount of ice time the two positions will log on a nightly basis, it begins to bring the differences into focus. Top pairing D men are a scarce resource, but RW are basically a dime a dozen. Eberle for Burns, Seth Jones, etc., whether stand alone or in a package would get my support every time. Here is one thing to think about. Nikitin and Purcell are UFA’s at the end of the year. To buy them out, you would save yourself room on the cap this year but at the end of this coming season, they are gone completely. I would definitely explore with other teams so see if you could include them in a package to a team that wants to shed a little salary first. Maybe a team has a guy that is locked up longer term for similar dollars and they would like to shed that salary moving forward because they have a bunch of RFA’s coming due after next season. 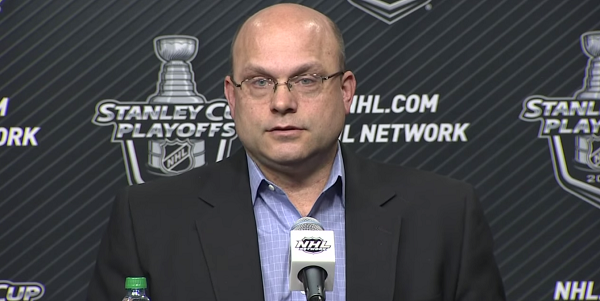 What happens towards the trade deadline? If something comes along and keeping them means you can’t fit them into your cap, then maybe you buy them out but buying them out to save 1 season I don’t know is the best thing. There is always the chance that they play decent and you can unload them at the deadline for a pick to a playoff team because they are UFA’s. Why buy out anyone. I’ve been stressing to keep NN because a) contract year and might play well; b) someone has to keep either Marincin’s or Nurse’s spot warm; and c) it’s just for 1 more year while the youngster develop and sheltered. Purcell can provide some experience and give Schultz a 1 year deal then trade when most convenient. ***ON AVERAGE PAYING Hall, Ebs, Nuge, McD, Draisaitl, Yak (no inflation accounted for) and paying 3rd and 4th liners $1M each. Nurse, Klefbom hopefully playing and earning $6M each while the second pairing earning $3.5M each and bottom pair $1M each. Isn’t that a lineup to be reckoned with?